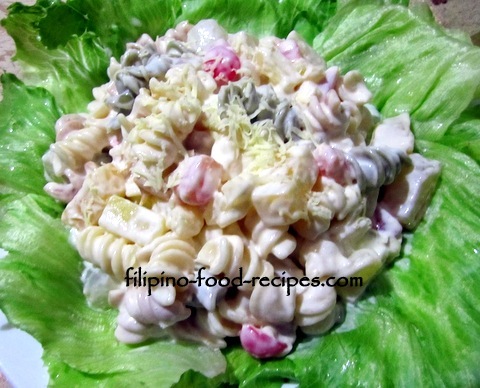 Fruity Pasta is like the Filipino Fruit Salad but with pasta. Basically, the pasta is sort of a food extender so there will be enough portion for everyone without breaking the bank. The first time I had this was at a buffet restaurant. It looked weird with the pasta because I was so used to having just fruit salad. I couldn't tell whether it was for snack or dessert, but it didn't matter, I just couldn't stop eating once I started. I also knew it would be easy to make, that even my kids could do it. So that is how this recipe came to be. Any shape pasta could be used, or whatever you have handy. If all you have is spaghetti or fettuccine, try cutting them in 1 inch to 1 1/2 inch lengths. I like the colorful spiral ones. See if you could find alphabet pasta, kids would go crazy over them. Just cook the pasta and cool down completely so the cream and mayonnaise stay thick. Then mix all the other ingredients and toss in the pasta. 1 Cook the pasta in boiling water with some salt and oil until tender (but not soft) -- follow box direction. 2 Drain and cool the pasta down completely so the cream and mayonnaise not liquefy and be runny. 3 Toss the pasta with the fruit salad and add half of the shredded cheese. 4 Refrigerate for at least 2 hours. 5 Serve cold on a bed of iceberg lettuce, topped with the rest of the shredded cheese.